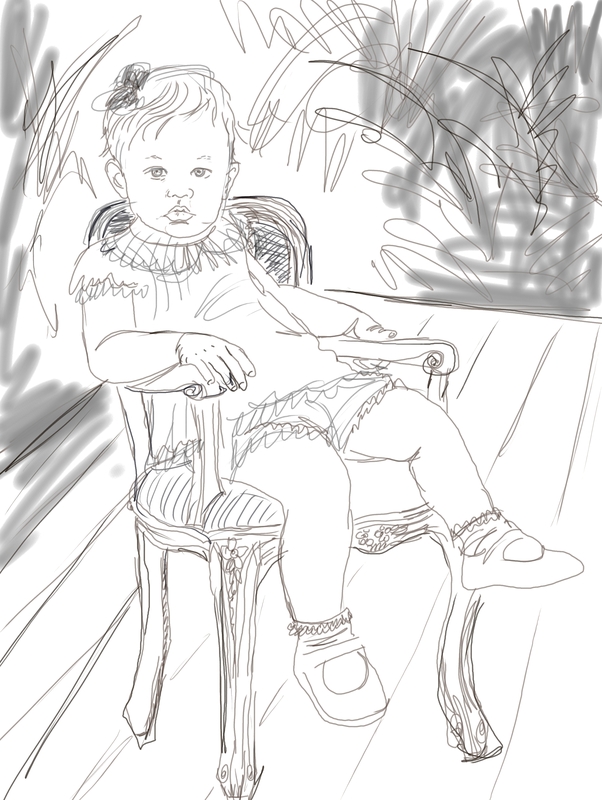 I want to paint a portrait of beautiful little Heather…and here is a marker sketch I made to plan that portrait. I like the composition, but I think it needs just a bit more “room” around the subject so she isn’t so crowded by the sides of the canvas. The foliage in the background will be very muted and soft so it won’t detract from her delicate features. I’ve shown the sketch to a few people and some have asked why I don’t show her smiling. Smiles are great for photographs and snapshots, but a portrait is a much more serious and weighty thing. It is a lasting representation of the subject’s character and personality, not just their happy face coaxed at one moment in time into giving a big smile for the camera. There are about 100,000 photos of this lovely child smiling and laughing…and just seven of her with her face natural and in repose…I took those. To me, this is the real Heather. I want to capture the intelligence and thoughtfulness I see in her when she is quiet and not posing for the camera.